BASSETERRE, ST. KITTS, (CUOPM) – St. Kitts and Nevis Prime Minister Hon. Dr. Denzil L. Douglas Monday called on Leader of the Opposition Hon. Mark Brantley and opposition party PAM Leader, Mr. Lindsay Grant, to apologise to former Attorney General Dr. Dennis Merchant after an Eastern Caribbean Court of Appeal, overturned his Contempt of Court conviction. “It is really a pity that the opposition at that time, used in my opinion, a situation to condemn my former Attorney General, basically humiliating him and I really think that he deserves an apology, not only from the People’s Action Movement (PAM) Leader (Mr. Lindsay Grant), but also from the Leader of the Opposition, Hon. Mark Brantley,” said Prime Minister Douglas when he arrived at the Lee Llewellyn Moore Judicial and Legal Services Complex after the verdicts were delivered. “I think that the former Attorney General has been vindicated. It is really a pity that the country had to go through these agonising months for him to be vindicated,” said Prime Minister Douglas. Lead Dominica-born attorney, Mr. Anthony Astaphan, S.C. shared the view of Prime Minister Douglas. He said having listened to the Appeal Court judgments, it is clear that there was no basis for the allegation of contempt. 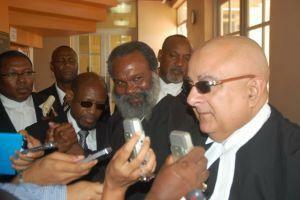 “Secondly, the judges seem to be very clear in their minds as well that the (High Court) Injunction, which formed the basis for all of this mayhem, was extraordinarily vague, did not apply to the Parliament (St. Kitts and Nevis National Assembly) and did not go beyond the submission of the Constituency Boundary Report to His Excellency the Governor General,” said Mr. Astaphan. “They need to hang their heads in shame, retract their demands for his resignation and immediately apologise publicly not only to Dr. Merchant, but for misleading the people of St. Kitts and Nevis about what actually transpired. I think more importantly is the complete vindication was that the judges were very clear that there was no basis for contempt,” said Mr. Astaphan. He said the Prime Minister, the Attorney General and the Government will be looking at the implications of the judgements “in so far as whether or not, it went beyond the submission of the Constituency Boundaries Commission Report. “There were even people today, seeking to publish absolute nonsense and hogwash on the internet about the (St. Kitts-Nevis Labour Party) Government violating the law. If I am correct in my understanding of the judgement, there is or was no basis for any suggestion that the Prime Minister violated any Order of the High Court in laying the Constituency Boundaries Commission Report in the Parliament,” said Mr. Astaphan.